Looking for the Irish gift of the gab? Legend has it that kissing the Blarney Stone will help anyone become more eloquent and more charming. The Blarney Stone is a major must-see for many visitors in Ireland, but no one is puckering up to kiss a rock set in the Irish countryside. Instead, the Blarney Stone hangs off the outside of a tower at Blarney Castle near Cork. So how do you plant a big one on Ireland’s most famous stone? And why do people believe it can give you the gift of the gab? Prepare for the big kiss with this complete guide to the Blarney Stone. The history of the Blarney Stone is as legendary as the mystical powers the rock supposedly now possesses. There is no one single story about how the stone came to be, but the competing myths are part of what makes the famous stone so intriguing. Several stories claim that the slab of limestone is part of the Stone of Destiny and was used in Scotland to choose the next rightful king. Some say that the Blarney Stone is cut from the same material as Stonehenge (though geologists tend to disagree on this one). Others argue that the stone was a gift from Robert the Bruce to the Irish Chieftain Cormac MacCarthy as thanks for his support against the English in the Battle of Bannockburn in 1324. The current-day Blarney Castle website admits that they are not sure where the stone came from but that they believe a witch revealed the rock’s special powers to the MacCarthys, who once owned the castle. While it is not possible to prove exactly how the Blarney Stone ended up in the tower of Blarney Castle, we can tell a bit from scientific tests. For example, researchers estimate the stone is about 330 million years and made up of Irish limestone from the south of the Emerald Isle. After that? It depends on which legend you believe. The Blarney Stone is located at Blarney Castle. The fortified home is one of Ireland’s best castles and dates back to the 15th-century. Visiting the castle requires paid admission, but once inside it is possible to tour some of the old rooms as well as to walk through the pretty gardens which sit along the River Martin. Most people visit the castle for the Blarney Stone itself and wait to place their lips on the famous rock. Kissing the Blarney Stone calls for a little bit of courage and a tiny bit of help. Those who want to earn the gift of gab must lie down and hang their head and torso backward through a small opening over the edge of the tower’s battlements. Another person helps to steady you while you hold onto two handlebars and lean back to kiss the stone. The Blarney Stone can be found atop the tower of Blarney Castle. The castle is located five miles from Cork, Ireland’s second largest city. Blarney Castle is open throughout the year, though it closes at 5 pm in winter verse 7 pm at the height of summer when the evening light lasts longer. The castle is closed on December 24th and 25th but is open on all other holidays with slightly limited hours. The Blarney Stone is located outside so it may be difficult to climb the stairs to the top of the tower where it is located if the weather is especially bad. Normal drizzly Irish weather might dampen things a bit but will not impact being able to visit the stone. Tickets can be purchased on the spot when you arrive, but there is a small discount for booking in advance online. If the Blarney Stone is a must on your trip to Ireland, it is best to travel there from Cork. However, it is possible to get to Blarney Castle from Dublin, as well. The Blarney Stone is about a three-hour drive from the Irish capital, which means six hours round trip (or longer with traffic) if you plan to return to Dublin on the same day. Take the N8 south towards Cork and then follow the signs to Blarney. Given the distance from Dublin, it is difficult but not impossible to do using public transportation. The best option is to book a train from Dublin (Hueston Station) to Cork (Kent Train Station), which takes around two and a half hours. The easiest way to get to the castle itself is via taxi from Cork. There are also several Dublin-based companies that offer day tours and take groups to and from the Blarney Stone in a private coach bus. 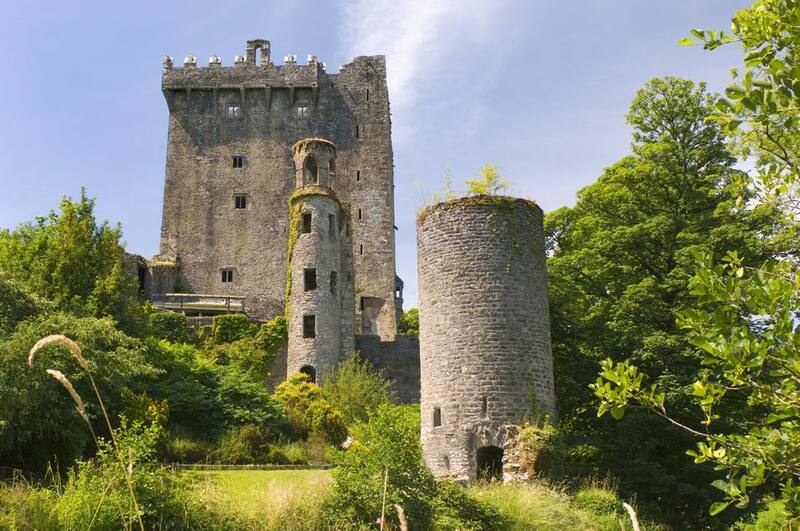 Not to be confused with Blarney Castle, Blarney House is a stately manor house that sits about 200 yards away. The house can be visited during the summer and is an excellent example of a Scottish Baronial mansion from the late 1700s. Irish souvenir hunters can find a huge selection of local gifts at Blarney Woollen Mills, a store built in a historic tweed factory.